Sail, relax, snorkel, and explore on a classic tall ship! Perfect for everyone! Enjoy the rope swing or bow nets on the boat - features unique to Solway Lass! Solway Lass is the best way to experience a traditional sailing trip around the Whitsundays - with history below your feet and sails above! The billowing sails, wooden details and friendly crew give her the extra touch needed to make Solway an unforgettable tour. While on board guests will get the chance to snorkel, visit Whitehaven Beach and relax for the ultimate Whitsundays experience. Enjoy swinging from the Tarzan rope! This 2 day tour attracts a mixed group, with several accommodation types available, giving this tour a fun, friendly feel! 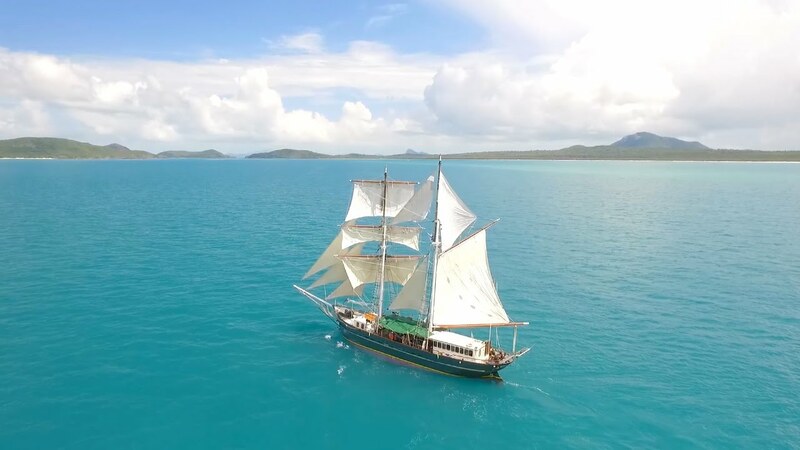 She is a stable vessel which sails around the Whitsunday islands leading you on a journey that will include plenty of activities and plenty of sights to see! Your nights will be spent in a comfortable cabin which is lined with cedar and teak and softly lit with a modern brass lantern, leaving you feeling relaxed in the heart of this historical boat. Solway Lass is also available for Private Charter. Journey to Whitsunday Island, where it is time to hit up the famous Whitehaven Beach! You will have plenty of time to soak up the sun, go for a refreshing swim, even wade among harmless baby sharks and stingrays. Be sure to have your cameras ready because you won't want to miss the opportunity to capture the most incredible view of the swirling sands of Hill Inlet and Whitehaven Beach! Your tour guide will take you for a scenic bush walk up to the lookout to enjoy the view and take some photos. Solway Lass will give you plenty of opportunities to hop in the water and check out the amazing fringing reefs of the Whitsundays! We will take you to some of the most colourful and diverse reefs around, giving you a chance to explore the underwater world and see all it has to offer. All snorkelling equipment and tuition is included, ensuring you're comfortable in the water and able to enjoy the reefs for the ultimate experience. 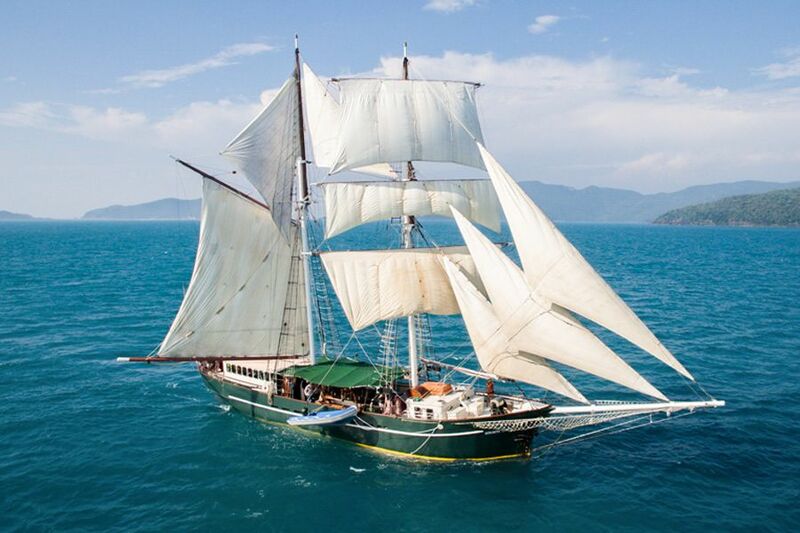 Solway Lass is one of the most impressive sailing boats in the Whitsundays. Her sheer size and billowing sails makes her a sight to see as she weaves her way around the islands. Watch as your crew skillfully climbs the masts to sets the sails, allowing the power of the wind to take you around. Don't forget to ask the skipper for a turn at the helm taking the chance to steer Solway for yourself! Solway Lass also has stand-up paddleboards that are free for passengers to use, offering another way to enjoy the stunning Whitsundays and its warm, blue waters! You can also enjoy a bit of extra fun back on board with the fun rope swing! Take the leap and swing into the water with a splash as everyone looks on. And don't forget to take a turn sitting in the bow nets up front, dangling your feet out over the water as you relax! Solway Lass is a comfortable vessel, featuring air-conditioning, separate male and female bathrooms as well as 11 private double, twin or shared cabins. The cabins are appointed with brass lamps, cedar and oak timbers, personal reading lamps and comfy beds. She was originally launched in 1902 and is 88 feet long. 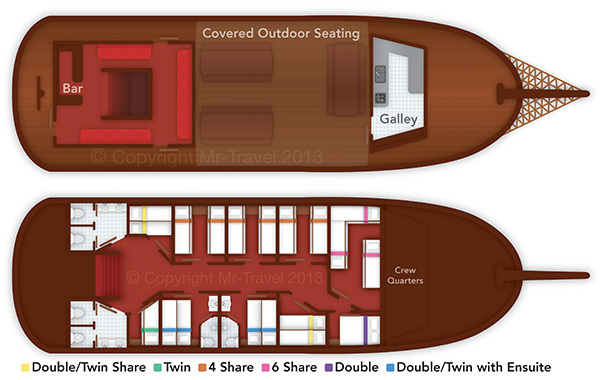 *Private Triple and Quad Cabins available on request. Please enquire for more details. Do you have a history of respiratory problems, severe attack of hayfever or allergies, or lung disease? Do you have active asthma or history of asthma, emphysema or tuberculosis? Do you have behavioral health problems or a nervous system disorder? Do you have a history of heart disease or heart attack, heart surgery or blood vessel surgery? If any of these conditions apply to you, you will need to tell the staff when you board the vessel. *A $20 per night (per person) Public Holiday Surcharge is applicable to tours departing on the 24th, 25th and 26th of December 2019. New Years surcharges may also apply, please enquire at the time of booking. All departures and itineraries are subject to weather. Tours may be changed or cancelled for any reason at the discretion of the Tour Operator. It should be noted that adventure travel involves risk. Whilst we make every effort to safeguard clients, we cannot be responsible for personal injury or loss due to actions of our clients which are beyond our control. We recommend that all clients have travel insurance covering illness, injury, loss or damage to personal belongings and not being able to travel on the confirmed date of departure. Please be aware operators pass on credit card merchant fees so there is a non-refundable 2.5% surcharge for VISA and MASTERCARD card purchases. This is a water-based activity, for safety reasons ALL passengers must be able to swim and speak fluent English. Please advise us before booking if any passengers are under 18 years old to ensure this is the appropriate trip. Also, please note that you need to allow time prior to the boats departure to check in, please ask us for more details. All cancellations made result in 25% cancellation fee of the recommended retail price (RRP), not discounted or sale prices. Any cancellations made 60-30 days prior to travel will result in a 50% cancellation fee and any cancellations made inside of 30 days to departure will result in forfeit of full trip fees. If the sailing company has to cancel the trip (prior to the boat's departure) and we cannot offer a suitable alternative, then a refund will be given minus card fees. We strongly recommend that you have travel insurance, especially during the wet season. "This was the best trip I went on during my stay in Australia. The crew was very nice, friendly, and humorous. We had a great group, which made the entire cruise a whole lot better. We got to do a lot of activities including paddle boarding, snorkelling, rope swinging, and sailing. We got to help set out the sails as well, which was very nice. Lots of fun with the crew, and lots of great food made as well!"